Instruments Make Play is een nieuw platform voor de bouwers / artiesten van nieuw uitgevonden, onconventionele muziekinstrumenten. Op zaterdag 8 december presenteert Instruments Make Play vanaf 2 uur ‘s middags tot 8 uur ‘s avonds een uitgebreid programma in WORM dat het midden houdt tussen een festival en een beurs voor zowel publiek als makers. Op elk moment van de dag zijn er performances te zien en te beluisteren, naast de vele te aanschouwen installaties en presentaties in de zalen van WORM. Iedere instrumentenbouwer geeft een korte showcase. Alsof dit alles nog niet genoeg is, is er voor de echte diehard aansluitend de elektrieke, modulaire afterparty van de Noodle Bar in de foyer van WORM. 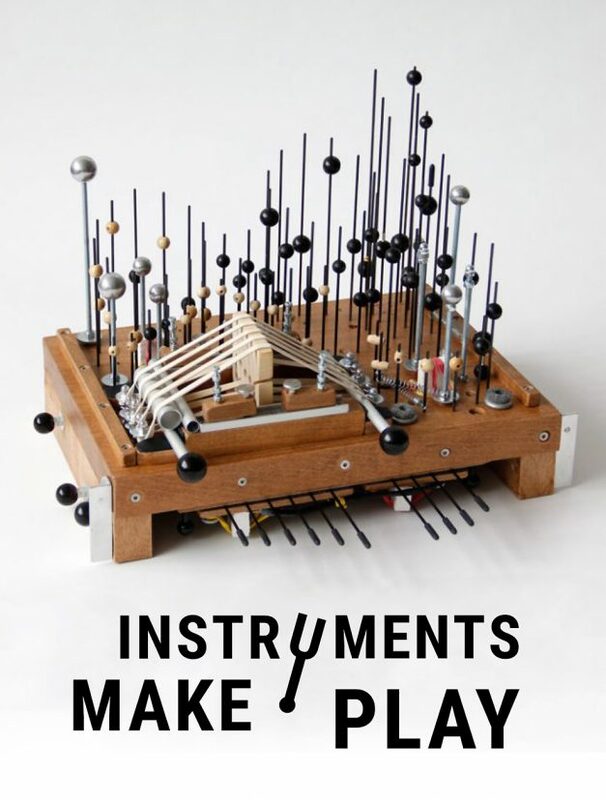 Instruments Make Play is a new platform for the inventors / players of newly invented, unconventional musical instruments. On Saturday December 8, from 2 PM to 8 PM, Instruments Make Play presents an extensive programme in WORM, which is basically 50/50 festival and fair for both public and makers. Throughout the day there are continuous performances and showcases to see and listen to, in addition to the many installations that are on view. Additionally, there’s Noodle Bar’s electrical and modular afterparty for the real diehard in the WORM foyer afterwards. Musician, improviser, instrument-builder. His “Prepared Chamber” is a resonant wooden box in which numerous mundane objects are organized and amplified by magnetic pickups and contact microphones. DIY media artist who develops his creations from re-used material, making use of existing techniques and DIY manuals. His works mirror the social aspects of technological progress. Will present his “Marine Debris Sound Instruments”. Aka Kacper Ziemianin. An artist with a classical musical education and an interest in various musical genres. Ziemianin builds his own musical instruments, modifying existing constructions, as well as interactive audio-visual installations. A sound artist who designs and builds site-specific compositions (mostly under the name of Lost & Found Orchestra) for spaces and objects, which turn these locations into temporary sound installations. Electronic music producer turned installation artist and instrument designer who develops various instruments and sound utilities under the name Soniphorm (a preamp for coils, piezos and condensor mics called the SoundSniffer). Piers developed the ‘Striso’, a new musical instrument with a distinct and versatile sound, combining the possibilities of electronics with the experience of an acoustic instrument. aka Jurgen Winkel: producer, musician, artist & performer. Currently combining electronic music & analogue sounds producing experimental and danceable music. Duo performance by Victor Snijtsheuvel and Owen Storni Hoogenboezem. Involves a computer program for a lightbox, a musical score, mini guitar and self-built double bass. Instruments Make Play is an event and production platform for self-invented musical instruments and its inventors/makers. It takes shape in the form of live concerts, exchange, workshops, exhibitions and residencies. The first events were launched in November and December 2017, in Rotterdam, Amsterdam, and Deventer. Instruments Make Play is Initiated, programmed and produced by Lukas Simonis, Julie Dassaud and Harco Rutgers.